You've seen them all before. Bill Gates with big red horns. Bill Gates with a Nazi armband. Bill Gates drowning baby puppies. 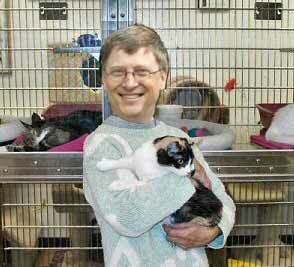 There are plenty of sites that host pics of Bill Gates doing some pretty awful things. Defaming Bill Gates's name is a time honored tradition as old as the internet itself. His character is further sullied by a myriad of offensive and poorly cropped photoshop forgeries that put him in very unflattering situations. It is a little known fact that Bill Gates and his wife, Melinda, make monthly trips to Calcutta where they volunteer time and energy towards assuring that the city's orphans are properly bathed and fed. Bill often takes scores of orphans to a dingy lake to bathe and later cooks them hamburgers. Orphaned humans aren't the only species to benefit from Bill's kindness. The Microsoft chairman and cheif software architect also donates a large amount of time to his El Paso, Texas animal shelter. There abandoned, sick and injured animals are cared for and delivered to loving homes. 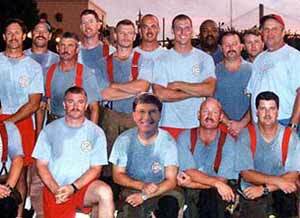 Bill Gates doesn't only donate time to his animal shelter, Bill Gates also works as a volunteer firefighter in St. George, Utah. His pale skin and lanky frame earned him the nickname La Computadora Blanca with his fellow volunteers in St. George. Volunteering to help extinguish blazes isn't where it ends for Good 'ol Bill. He's also been known to work at Fort Lauderdale, Florida's famous "Silly Beans" Clown School. There Bill helps out with the budding clowns' target practice. Bill Gates would lay awake at night as a child, thinking of all the children that weren't as lucky as him to have a loving family and a stable home life. He thought of those children less fortunate than him, particularly the young vampire boys and girls who went to bed hungry at night largely because of mankind's unjust and jittery attitude towards their particular diet of human blood. 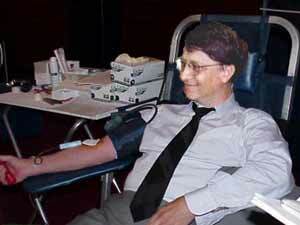 When Bill Gates became wealthy enough he vowed to help by opening his "Meals on Wheels... for Vampires" mobile bloodletting stations. Of the program Bill Gates says: "When you see one of our crimson Winnebagos pull up in your neighborhood, it would behoove you to donate some blood because feeding vampires is not only our duty in sharing this great Earth with them but it is best and easiest when done voluntarily."